Since 2005, Celer, the duo of the late Danielle Marie Baquet and William Thomas Long, have released a wealth of ambient material and established themselves as one of the preeminent and best loved outfits in the genre. For the uninitiated, Celer’s aesthetic is glacial, beautiful and devotional. It is utterly devoid of hard edges and culled from a wealth of exotic and traditional instrumentation. The pair’s inimitable sound is the result of careful attention to processing and a keen, quasi-cinematic ear for arrangement and juxtaposition. The source material for the recordings on Evaporate and Wonder was limited to improvised synthesizers and field recordings, but the end results are predictably grand and mysterious, suitable indeed for the promises of the album’s title. Comprised of two sidelong pieces, this record is a perfect entry point into the pair’s wonderful oeuvre or, if you’re like me, a more than welcome audio pictogram that lets us as listeners continue the journey. Four seconds of static start ‘Evaporate and Wonder’, another release from the secretive ambient project Celer, comprised of the late Danielle Marie-Baquet and William Thomas Long, before the slow-motion descent begins. Recorded in California in 2009, and released on March 13th, ‘Evaporate and Wonder’ is comprised of two sidelong compositions, and whilst these can be immediately distinguished from their more obviously sparse and glacial predecessors, the overall effect still gels with the pair’s labyrinthian back catalogue, which is identified as being amongst the most well loved and respected within the genre. Although upon hearing that the source material was limited to improvised synthesisors and field recordings one may initially begin to imagine Celer’s soundscapes to be decidedly ‘split’ down some half-way mark, both elements are in fact merged seamlessly, making listening to any individual record decidedly similar to slowly being pulled around by tides deep under the surface of the ocean. Whilst the heartbreaking backdrop to Celer’s releases post-July of 2009 does of course add a certain melancholy to their output, this isn’t to say it is in any way reliant upon this to impact upon the listener – this rather makes the recordings stronger in their emotive foundation. Long’s title to this particular section of their work, redemptive as it reads, seems to encapsulate both the artistic and emotional bond of two people more clearly than many other releases of a similar ilk. Opening track ‘Bedded in Shallow Blades’ immediately brings to mind the Celer of yesteryear, such as static-laden ‘Emotion’, yet still shows a definite development in sound that was so tragically cut off before reaching its apex, and is only being heard now, several years on. Deep sub-bass throbs glide to and from the listener through foggy notes, played at such a volume that they solidify, yet far away enough to remain as faint echoes of what they were, and walls of malleable tones. Indeed the sounds on ‘Evaporate and Wonder’ are, somewhat counter to what the former half of the title suggests, denser than ever before, yet still not claustrophobic in any way. Celer’s compositions still manage to retain a certain distance, as if coming from everywhere at once, and so don’t overwhelm the listener as other groups’ works so often can. Continuing on in respect to the quite obviously dual nature of the record, B-side ‘Repertoire of Dinless Shifts’, again far from what the title suggests, lifts the listener from the bottom of the ocean that ‘Bedded in Shallow Blades’ finally planted us on, but with one only realising as such as you begin to drift away. With the titles of the material being the only input that Long has had since the initial recording sessions were done, Celer releases are beginning to look, if not brighter, more accepting of the decidedly ill-hand the group, and Long, was dealt, with this release especially being a far cry from 2008’s ‘I Love You So Much I Can’t Even Title This (The Light That Never Goes Out Went Out)’. Saying much more about ‘Evaporate and Wonder’, although infinitely possible, become irrelevant. This is because simply labeling Celer’s releases as anything from ‘Drone’ to ‘Minimalist Electronica’ to simply ‘Electronic atmospheres’, as well as trying to aptly describe them, cannot do them justice. The simultaneously ethereal yet deeply emotive creations of the late Danielle Marie-Baquet and William Thomas Long are ones that simply must be listened to, time and time again. Another good release from Experimedia, this time focussing on the hushed, tremulous drones of Celer. It’s rare to hear ambient music as confident as consummate as this – Celer pack an inordinate amount of textural and harmonic incident into their lengthy compositions without ever disrupting the surface of calm and stillness – listening to ‘Bedded In Shallow Blades’ and ‘Repertoire of Dinless Shifts’, you feel like you’re gliding. Honestly, we’re the first to admit that there’s a surfeit of neo-classical ambient music being made these days, but you shouldn’t let that prevent you from immersing yourself in the sheer heavenliness of Evaporate and Wonder. Evaporate and Wonder is an ember of an ember, an echo of an echo, a ghost of a ghost, barely there yet fully present. This slowly meditative pair of tracks has all the power of a leaf floating down a lazy river, which is to say not much, or a great deal, depending on one’s perspective. Could one watch such a leaf, hopping shore to shore, stone to stone to trace its progress? Or arching backwards, to its position on the tree, its browning, its full-fledged greenery, its first appearance as a shoot, invisible veins edging toward the sun? ”Is it easier to begin or to end?” asks Dani in the poem on which the album is based: her words, her presence kept alive by her husband on this tonal recording in such a way as to make one ask, what if you didn’t have to choose? What if one were perpetually beginning and ending in a way that erased the dividing line? When Dani writes of water spilled like a life, she leaves readers with an enduring question: ”Was it worth it?” Will Long’s continuing answer is yes – it was, it is. He’s passed beyond prowess and love, and is now in a nether zone of remembrance and recycling, providing what is in essence an evaporated recording that inexplicably beats with life. Our Phil tends to review most of the Celer records we get in because he can’t get enough of the drifty stuff, but this week he’s decided that for the purpose of balance someone else should have a go. Two other people, in fact, since this isn’t the only Celer release this week, so I guess there’ll be another one coming soon from Brian or the Business Lady. If nothing else, you certainly have to admire Mr Long’s workrate. Also, these kinds of records are notoriously difficult to review because despite the great beauty on display, it’s a beauty of a fairly constant and unchanging kind. On this LP, the source material is limited to improvised synths and field recordings, and what we’re left with are glassy, shimmering swells of concordant high and mid end drone that twinkle and murmur and ease in and out, teasing you into a healing state of calm. That’s what happens on this record and there’s not much else to say about it except it’s right up there with Celer’s finest work and super limited (as usual) and comes with a download and chances are you knew you’d like it before you started reading this review anyway. It’s presently 3:11am. The house is perfectly still and quiet, the only sounds to be heard are the occasional rustle of beds sheets and the tapping of my fingers on the screen writing this review. Of course, if you strained hard enough, you could probably just discern the gentle drone flowing softly from my headphones, but that is precisely the point; this is minimal, sparse music that asks shyly to be played during the witching hour, when the house is most silent, when mental cognisance begins to wane, when eyelids begin to droop. Evaporate and Wonder is that rare and elusive thing; a perfect substitute to silence, one that is better than the sound of nothing at all. I can hear the softest ebbs and flows within the drone; thin, quavering melodies stretch out in the air like gossamer strands, rising and falling hypnotically yet only changing their volume by the minutest fraction. Have you ever gone outside on a cold winter morning, leaned your head back and exhaled, simply to see your breath appear in front of your eyes? Of course you have, everyone has. I still do it aged 19, and do you know why? Because its fascinating. Change the shape of your mouth and the force of your breath and you can alter the shape and distance and speed of the steam. Sometimes, instead of forcing it all at once, I breath out slowly, admiring the curlicues of steam exiting my mouth. That’s what Celer is doing here, altering the shape and force of his music and admiring its curlicues. And you know how morning light is delicate and beautiful with its soft, pastel tones? And how there is a bite in the air, a sharpness, a crispness that burns the soft exposed skin of your nose and ears and waters your eyes? And how sounds feel almost muffled and subdued? It feels like Celer has picked one of those moments, where all of those sights and sounds and sensations are temporarily put aside as he tilts his head back and exhales, hearing nothing but the sound of his emptying lungs and seeing nothing more than minute water particles rise in the early daylight. Evaporate and Wonder is the distillation and dilation of a single yet oft-repeated moment, that instant of strange fixation and amusement and intrigue gleaned from an act we perform every moment of every day made observable. Evaporate and Wonder indeed. I can’t describe to you the musical content of the two tracks of this album, drone and ambient cannot be defined in such a way. All I can offer are some of the feelings this music gives me, even though I know I haven’t even begun to adequately described how this makes me feel. The prolific ambient duo of William Thomas Long and his late partner Danielle Marie Baquet recorded Evaporate and Wonder in 2009, another fine entry in their vast catalogue of shapeless drones. It’s difficult to do their music justice in writing, because it is so gaseous and vague. It’s almost more of the suggestion of music rather than any outright musicality, if that makes sense. Like an afterimage rather than something concrete. The two long halves here are airy and light but not without a suggestion of some obscured darkness. The second half, “Repertoire of Dinless Shifts,” is especially murmurous. I’d liken its slow fade to faint moonlight refracting underwater, the suggestion of light without direct impact. Despite a subtle tension that occurs within the sea of drones, this is quite peaceful and serene. It’s tempting to lump so many of these ambient-drone releases together and write them off as “been there, done that,” but among some other contemporaries Celer tends to deliver nearly every time with a gorgeous result. Evaporate and Wonder is just one of those, recommended for fans of the more delicate and hushed side of ambient music. Issued by Experimedia in limited twelve-inch LP (300 copies) and download formats, Evaporate and Wonder is quintessential Celer moodscaping. For trainspotters of the group, it’s also significant for perhaps being one of the last works recorded by Celer in its husband-and-wife incarnation of Danielle Baquet-Long and Will Long (Evaporate and Wonder was recorded in May of 2009, two months before Danielle’s death on July 8). The material lends itself naturally to an LP presentation, given that it’s comprised of two pieces, each in the twenty-minute range. The first half, “Bedded in Shallow Blades,” is a prototypical Celer slow-jam, a glacial and silvery flow of processed sound that’s ethereal in the extreme. “Repertoire of Dinless Shifts” opts for a slightly lower-pitched rumble as a counterpoint to the higher-pitched tones that hover endlessly above. In both pieces, the music unfolds like the prolonged exhalation of a long-held breath as organ and string tones weave in and around one another, merging and blending like liquids. 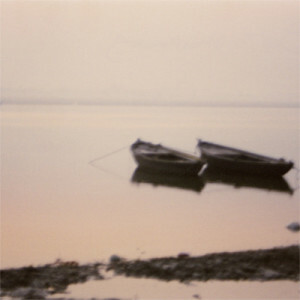 Synthesizers and field recordings might have provided the source material for the two settings, but, as per usual in the Celer universe, the originating sounds have been modified to such a degree that any identifying detail has long been left behind, leaving in its wake an abstract mass of shimmering haze with only the most tenuous of ties to the earthly domain. Tutti i compositori ambientali, prima o poi, si trovano a fare i conti con il grado zero della loro forma espressiva, finendo per confrontarsi con qualcosa di molto prossimo al silenzio. Will Thomas Long non sfugge a tale ambiziosa prova, proponendo in “Evaporate And Wonder”, due tracce di circa venti minuti l’una, la cui calma e apparente staticità sublima una testimonianza di quanto offerto dal progetto Celer in ormai un centinaio di pubblicazioni soliste o in duo. Le registrazioni alla base di “Evaporate And Wonder” risalgono al 2009, pochi mesi prima dell’improvvisa scomparsa di Danielle Marie Baquet, compagna di Will nella musica e nella vita. Un’emozione ancor più intensa percorre dunque oggi l’ascolto delle due composizioni, fragili contemplazioni di una bellezza fugace, rappresentata da rispettosa distanza attraverso un’evanescente coltre di synth e field recordings improvvisati. Sulla persistenza vaporosa di sottili layers di fondo, si incardinano strumenti appena percettibili, mentre solo “Bedded In Shallow Blades” presenta un lieve crescendo che avvolge in morbide spirali, ideale punto d’incontro tra musica ambientale e neoclassicismo suonato da un’orchestra immaginaria. E memoria e silenzio, appena un passo più in là.